Description of "Build Up Class: Keep it Simple (Motivation via Scriptures) "
"Build Up Class" (First Edition) has a collection of about 50+ (quotes,musings, tales, thoughts) all together; which has some relevant, factual and practical answers to situations in which teen usually messed up with and think everything is gone but there's always a way out. You will have fun reading it and hope it will answer few tricky situations which always makes us think about whether to go for it or wait. "Scriptures are understandable when approached and read with deep emotions and mature lookout." "Always be known for your Perception"
Outgoing personality, Love to travel and explore the world at fullest. 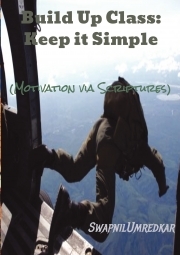 MERI KALAM NE JO KAHA by AMIT KUMAR MITTAL "MAUSIK"
Reviews of "Build Up Class: Keep it Simple (Motivation via Scriptures) "